It’s hard to imagine the sense of infinite potential accompanying the arrival on the North American continent in the 1600s . 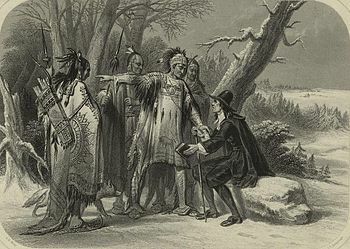 . .
Roger Williams came to the Massachusetts Bay Colony in Boston from England. Four years later, in 1635, he was banished from the colony for, among other things, speaking out against the right of civil authorities to punish religious dissension. After leaving Massachusetts, Williams, with the assistance of the Narragansett tribe, established a settlement near Narragansett Bay, located in present-day Rhode Island. He declared the settlement open to all those seeking freedom of conscience and the removal of the church from civil matters. ← Eliminate the Handshake Line? Anytime men base their criminal code on the over 600 Old Testament commandments, as happened in the Massachusetts Bay Colony, bad things are going to happen. In fact, things turned out so badly in Massachusetts that, not only did the writers of The Constitution a little over a century later exclude any mention to God, they forbade religion to be the basis for selecting government officials!